This Wednesday (tomorrow), join us for April political pub night, at Südblock in Kreuzberg. Pub nights are low-key, social events for progressive Americans and friends in Berlin to get to know each other and converse about the newest additions to the Democratic primary field, or whatever else you'd like. ►Details here. Our next meeting in May will be the first Tuesday, May 7th, 2019: "Organized Labor's Role in U.S. Elections" with guest speaker Thomas J. Adams, whose research focuses on the history of American labor, political economy, and social movements as well as New Orleans. Want to get involved? Drop us a line by replying this email. Have you taken our member survey yet? 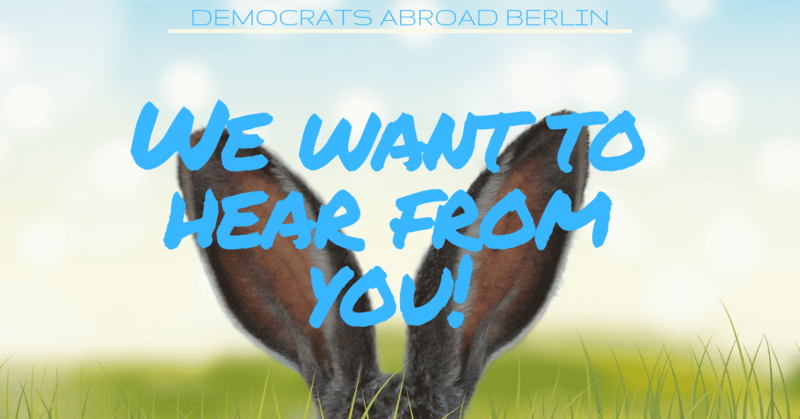 Thanks to everyone who’s already taken the Democrats Abroad Berlin member survey! If you haven't, we'd still love to hear from you. Your responses will help us improve our events, our outreach, and communication. Please fill out the survey by Friday, April 19th, 2019. It's only 9 questions and won't take more than 5 minutes. Sponsor a Runner For Democracy! Host a Democrats Abroad Berlin meetup! We're asking for your help to make more events happen in more parts of Berlin. If you'd like to put together a board game night, a movie club, running group, a podcast-listening meetup, a dinner discussion, or anything else that helps bring Americans living in Berlin together, please get in touch. We'd love to see more diverse get-togethers in all the Berlin neighborhoods -- from Zehlendorf to Marzahn and everywhere in-between. 🌈LGBT Streetfest🌈- Save the date! When you think about Democrats Abroad Berlin, what do you envision? What issues are of most interest to you? How can we best bring people together to help create change? These are some of the questions we'd like to ask you in our short member survey. The goal: to learn more about our members, gather feedback, and support our Berlin-based community better. This survey takes up to 5 minutes to complete, and is open to all DA Berlin members until Friday, April 19, 2019. If you choose to provide your email, you will also be eligible to win a Democrats Abroad gift! Look in your email inbox for the invitation to take the survey -- sent around noon (12pm) on Wednesday, April 10, 2019 with the subject "We need you! Democrats Abroad Berlin Member Survey"
Simply click the link in the email to access, answer and send off your response and, in turn, we will report back with interesting insights. Together, we can shape what this chapter looks like and make sure that we are engaging all members to the best of our ability. Immediate action is needed to protect our environment and to drastically decrease carbon emissions. Facing this imminent threat brings up the question: what can I do? We'll discuss the multiple political avenues of addressing climate change. Is individual action enough? If not, what type of collective political action is needed? We're excited to welcome special guests Georg Kössler, Green politician (MdA) in the Berlin state parliament (Abgeordnetenhaus von Berlin), spokesperson on the climate, environment, fair trade, and club culture for the German Green Party in Berlin, and Lubomila Jordanova from Plan A, a data-driven action platform in the fight against climate change. P.S. Live in Dresden? Know someone who lives in Dresden and wants to be part of the ever expanding Democrats Abroad Dresden? Scroll down to "Upcoming Events" for details on Taco Tuesday in Saxony's capital! Calling for Virginia: 1 Vote Flips the State Legislature! The majority in the Virginia state legislature was decided last election by a coin-toss. This had real repercussions, like the deciding vote on ratifying the Equal Rights Amendment (guaranteeing women's rights in the Constitution) being decided by a Republican (spoil alert, it was voted down). 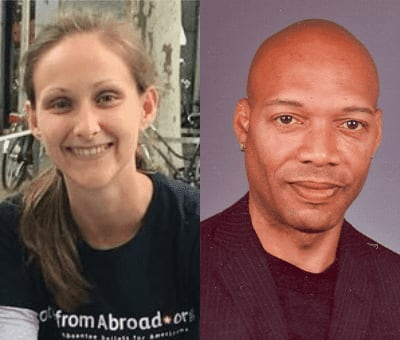 Democrats Abroad's main goal is to make sure that every Democrat living abroad votes and to help swing elections in the U.S. As a practice run for 2020, help us reach all Virginia voters living abroad and register them to vote from abroad: 2019 Virginia state elections will decide the majority in both the House of Delegates and the State Senate. Want to see more Democrats Abroad events in more parts of Berlin? If you have an idea for a coffee group, a dinner discussion, a podcast-listening meetup, or anything else that helps bring Americans living in Berlin together, get in touch. We'd love to see more diverse get-togethers in all the Berlin neighborhoods -- from Britz to Pankow and everywhere in-between. March Political Pub Night at The Lir this Wednesday! This Wednesday (tomorrow), join us for March political pub night, at Lir Irish Bar in Hansaviertel between Tiergarten & Moabit. Pub nights are casual, social events for progressive Americans (and friends) in Berlin to get together, meet new people, and chat about the political news of the day, or whatever else you'd like. Our next meeting in April will be the first Tuesday, April 2nd, 2019, save the date! Immediate action is needed to protect our environment and to drastically decrease carbon emissions. Facing this imminent threat brings up the question: what can I do? We're working on putting together a panel discussion to discuss individual vs. collective action. Host an Democrats Abroad Berlin meetup! At our March meeting, we put out the call for more events in more parts of Berlin. If you'd like to host a game night, a book club, running group, a podcast-listening meetup, a dinner discussion, or anything else that helps bring Americans living in Berlin together, please get in touch. We'd love to see more diverse get-togethers in all the Berlin neighborhoods -- from Britz to Pankow and everywhere in-between. Democrats Abroad sponsors caucus groups, which exist to engage members with a particular area of interest in campaigns, initiatives and advocacy projects. If you'd like to become more active in Berlin or Germany in championing one of these caucuses, let us know! Andrea Schwab, the secretary of Democrats Abroad Germany, has released the 2018-2019 annual report for our country committee. It documents the Annual General Meeting in February 22-24, 2019. ►View the annual report. Hello, my name is Aline Spyrka and I am the intern for the Berlin Chapter of Democrats Abroad! I am from the Bay Area, California and am studying abroad in Berlin. I was fortunate enough to attend Democrats Abroad Germany’s Annual General Meeting. This year’s Annual General Meeting in Heidelberg was the first Democrats Abroad event I attended. Overall, I really enjoyed this event and I learned a lot. I learned about the various caucuses, voting systems, elected positions, jobs/roles, volunteer roles, and about the various chapters. Specifically, Germany has 12 chapters and each newly elected chair for their chapter presented events they held over the year or activities they enjoyed. It was great to hear about specific events chapters held and which were similar to Berlin’s. Intros from each chapter were insightful and I appreciated the explanation of terminology/events. The caucus reports were also very informative for new members. One of breakaway events for caucus small groups was a great way to meet more people. I had wished I had more time to meet them and brainstorm for the youth caucus because I really liked meeting so many new people and hearing about their experiences abroad as an American and a Democrat. I now have friends to visit in Dresden, Heidelberg, and Muenster and know much more about Democrats Abroad Germany! This Tuesday, join us for our March meeting, where we'll focus on women's rights movements in the U.S. and in Germany, looking at the Equal Rights Amendment and the Paritätsgesetz. We'll also have a brief recap of the highlights from the Heidelberg meeting and present a new way of organizing events, for which we need YOUR HELP! Mark your calendar for March political pub night on Wednesday March 20th – we'll be trying out a new location: Lir Irish Bar between Tiergarten & Moabit. Details below. 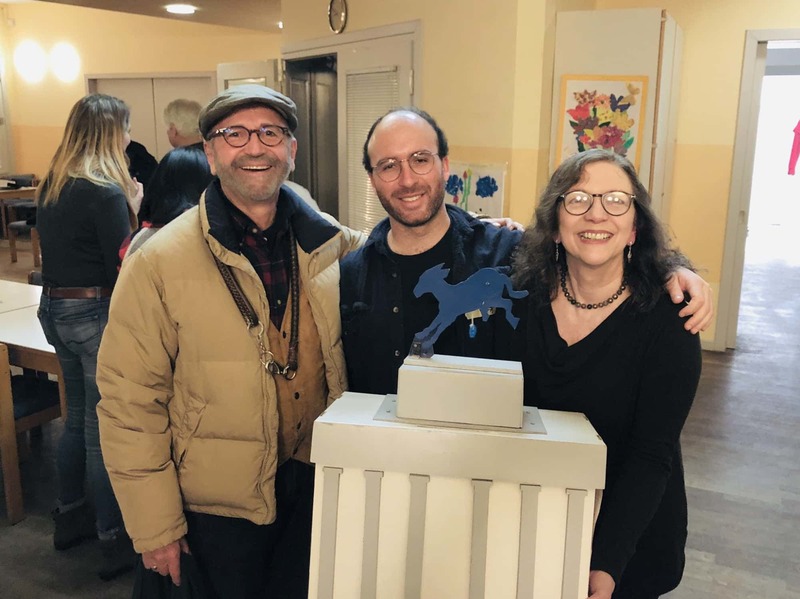 Members from Democrats Abroad Berlin travelled down south to Heidelberg to participate in Democrats Abroad Germany's 2019 Annual General Meeting. Participants came from all of Germany's 12 chapters, to share and reflect on our organization's efforts to get out the vote during 2018, organize and plan for the upcoming presidential primaries and elections, and elect our new Germany-wide leadership. 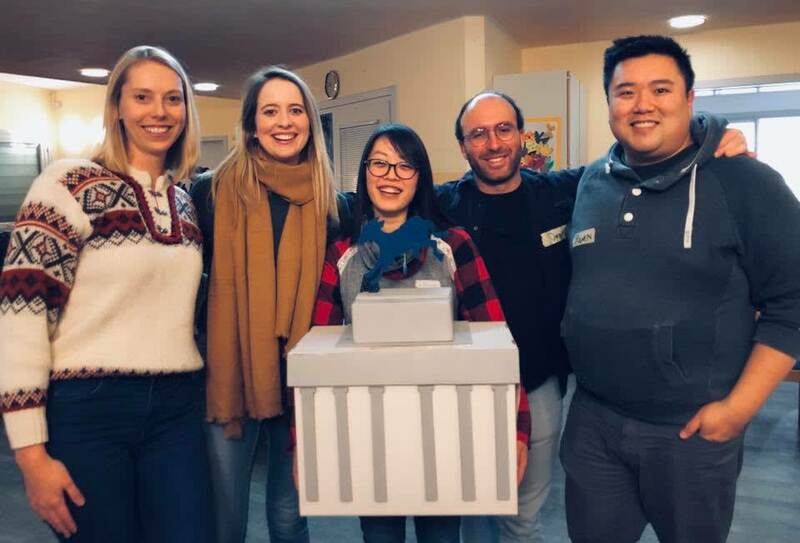 Members from Democrats Abroad chapter in Berlin travelled down south to Heidelberg this past weekend to participate in Democrats Abroad Germany's 2019 Annual General Meeting. Americans from all of Democrats Abroad Germany's 12 chapters and many other precincts gathered, to share and reflect on our organization's efforts to get out the vote during 2018, organize and plan for the upcoming presidential primaries and elections, and elect new Germany-wide leadership. Guests from other Democrats Abroad groups in Luxemburg and France attended as well. Local leaders Emily Lines (Berlin vice chair, left), Diego Rivas (Berlin chair, center), and Powen Shiah (Berlin Communication and Press Coordinator, right) were all elected as “DPCA Voting Representative." They, along with 9 other DPCA voting representatives elected for Germany, and Germany's chair and vice chair, will represent Germany's Democrats Abroad members to the Democratic Party Committee Abroad (DPCA). The DPCA is the governing organization of Democrats Abroad and is equivalent to a State Party Committee. Emily Lines was also re-elected as Events & Fundraising Coordinator for Germany. Andrea Schwab was re-elected as Secretary for Germany. Congratulations to Democrats Abroad Germany's new chair, Candice Kerestan (Munich, left), and vice chair, Kenton Barnes (Braunschweig, right)! Candice was previously precinct captain and then chapter chair of the newly-formed Cologne Bonn chapter. Kenton is precinct captain for Braunschweig and LGBT Caucus coordinator for Germany. Full details of results from the 2019 elections in Heidelberg will available soon on the Democrats Abroad Germany news page. This week is packed with events! There's an exhibition opening, our regular pub night, and a chance to participate in the annual general meeting remotely — something for everyone. We hope to see you at one of them! Tonight, the Women's Caucus is getting together to attend the opening night of the exhibition Stimmen! at Willy-Brandt-Haus. More details below, and don't forget to let us know if you decide to join. Tomorrow, we'll be heading to Eschenbräu in Wedding for our monthly political pub night. It's always a great time, so grab a friend and head over for something social. Can't make Democrats Abroad Germany's Annual General Meetingin Heidelberg this weekend? Not a problem! You can still join in and vote for Democrats Abroad Germany's leadership from here in Berlin. We will be setting up a remote votingand participation center from a member's home in Moabit on Saturday. RSVP for the exact address. Congratulations to the newly elected board of the Berlin chapter! 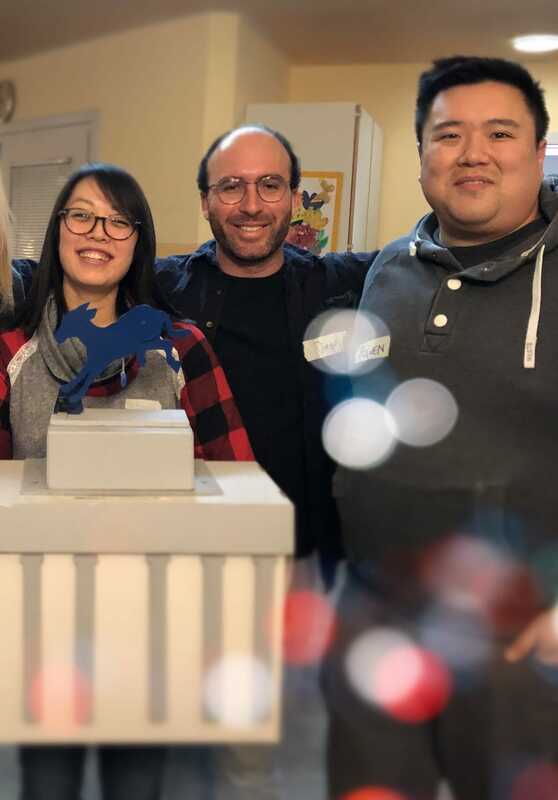 On January 29, 2019, at the election meeting at Begegnungsstätte Falckensteinstraße, the Berlin chapter of Democrats Abroad elected new leadership. Many thanks to our temporary election chair Hilary B., and the election monitors Andrea S. & Theresa G. as well as all the members who turned out to vote for our chapter leadership. It’s the first time the Berlin membership has directly elected any positions besides chapter chair, and an important step in increasing democratic accountability. This Tuesday, January 29, 2019, beginning at 7:30pm at Begegnungsstätte Falckensteinstraße, the Berlin chapter of Democrats Abroad Germany will hold elections for the chapter board. You can read the statements from the current slate candidates our website. Candidate nominations can also be made from the floor at the election meeting, if supported by a second from among the membership. For more details about the election process and descriptions of the positions being elected, visit the 2019 Berlin Chapter Elections page. Democrats Abroad Germany is hosting its 2019 Annual General Meeting (AGM) in Heidelberg the last weekend in February (Feb 22-24). We encourage members in Berlin to attend. Come network with other Americans from across Germany, be part of the discussion on the future of Democrats Abroad Germany, and vote on (or run for!) national leadership positions. Help Democrats Abroad telling our taxation stories! Democrats Abroad is currently conducting the 2019 Non-Resident Taxation Research Project. The taxation task force wants to hear from you to support efforts to persuade Congress to reform taxation laws and provide us with relief. Information gathered will be used to lobby Congress and federal government regulators and to illustrate the financial burden Americans abroad endure complying with the tax, banking, securities, and other laws that discriminate against us.